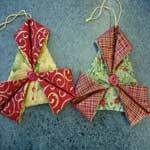 Sew Christmas ornaments for your tree this year and create heirlooms that will be enjoyed by your family for years. 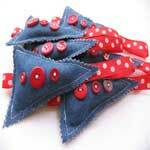 Make a blue jean Christmas tree or sew small felt stockings in various colors to adorn your tree. 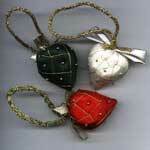 Choose one of the many Christmas ornament patterns below. 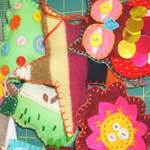 Make beautiful strawberry ornaments made using silk fabric and gold thread. 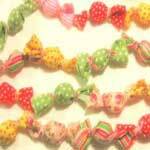 Create several using different colors of silk. This is a very easy project as it only requires cutting and folding fabric then adding a single button in the center. 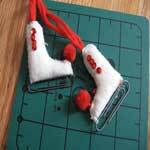 With a small amount of felt fabric and a sewing machine, you can whip out several of these tiny stocking ornaments in no time. 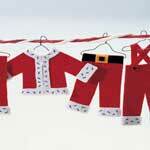 Make all of Santa's clothes in felt then hang them on little wire hangers for absolutely adorable Christmas ornaments. 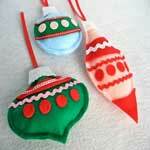 Here are traditional looking Christmas ornaments made out of felt in an array of colors. Great for package decor. Here's a really easy ornament pattern for making little trees out of denim fabric with buttons and a ribbon loop at the top. Create these adorable ice skates using felt, sequins, large paperclips and a few other materials. So cute! You can make three different ornaments for your Christmas tree by following these simple patterns. 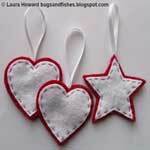 With loose stitching and red & white felt, you can create lovely Christmas hearts to add to your Christmas tree this year. Photo ornaments look great on the tree, embellishing a wrapped package, in a stocking or give as a gift. 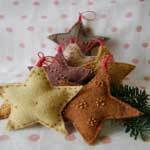 Here is a pattern to help you make these lovely star ornaments with felt, stuffing, gold seed beads and more. 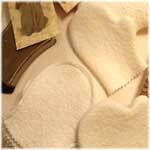 Make these precious little mittens that are lightly dusted with clear glitter to give the look of snow. 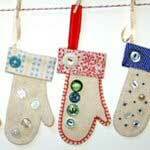 Make these sweet little mittens adorned with buttons for a lovely addition to your Christmas tree. Embroider names on them for a personal touch. 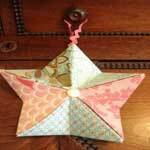 To make this star, use the same technique as when making a paper star only here you use fabric. Very pretty ornament! 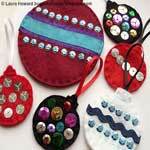 Easy to make felt ornaments embellished with sequins, ribbon, buttons, ricrac and more. These are fun to make. This adorable felt pony is made with an assortment of colors all in felt. 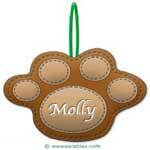 Make a mouse, fish, bone or paw with your pet's name on it. 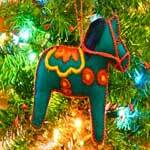 Create one or all four of these cute ornaments using this pattern. 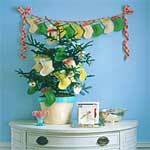 Small styrofoam balls wrapped in colorful Christmas fabric and sewn together make for a sweet garland to place around the tree. Here is an owl template plus instructions on how to make a cute little owl ornament out of felt.